Will there be disappointment 2moro in Jackson Hole afterall? After hearing the news from CNBC and watching how the market goes, I think it is not surprising anymore that we think Bernanke probably might not have QE3 2moro. As a contrarian, I think maybe 2moro might not be that bad afterall. The market always can be fickle minded and go against what most of us think. If Ben Bernanke gives any hints that is enough, the market might go up instead of being disappointed. But having said that, I am not taking anything for granted by liquidating my positions today. 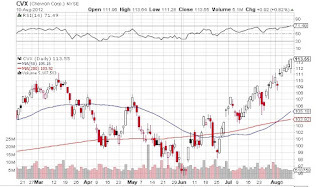 My game plan for 2moro may be to prepare myself to look at "SLV" (silver ETF). If there is hint, no doubt Silver and Gold will ascent. If there isn't, shorting "SLV" is an alternative. But I will also take note that Monday is Labor Day for US, so a holiday. Probably I would take up any stocks position over the weekend. Btw, Ben Bernanke might reveal some hints on the Jobs report coming out next week which I would take into consideration regarding my trading strategy next week! Though today I lose some of my profits due to early profit taking by the market, but it is still not a bad 2 trading days with a US$3585 profit in 2 trading days, a 10% ROI. 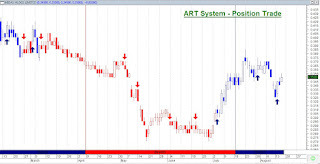 - Will Dow Jones and STI make a New High? Singapore goes down $30, when is a good chance to go in? 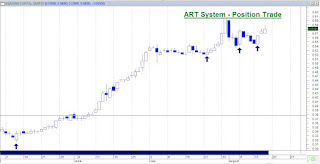 If STI does not go down, there would not be opportunities to buy your stocks at a discounted price. It is just a matter of when to enter now. Like what we mentioned in the previous article, I am liquidating my short term positions ahead of Ben Bernanke speech. In fact I think today's fall in Singapore and Hong Kong market is a reaction by the short term traders liquidating some of their positions. Remember that traders normally do not like risk. And exposing ourselves to an unpredictable decision by the FED involves risk. I am on the sidelines now waiting patiently to see the reaction of the market these 3 days. Firstly, my eyes will be focused on tonight Jobless claims at 8.30pm US Eastern Time. It will give a glimpse of what might be the outcome of the Non Farm payroll next Friday, and whether I should take the chance to enter next week. 2moro, my feeling is that probably there would not be QE3. So I actually am in the sidelines waiting for the market to react disappointingly. If not, there might not be a chance for me to enter the market. Next Monday, ISM report will tell me about the strength of the US enterprises . Of course, if things go bad, I will be looking to a triple digit increase next week to find confidence back in the US market. This week is crunch time. Get your weapons ready. There isn't any reason to panic yet. Instead there might be opportunities round the corner. Join us to know how to select the right local stocks! If you have problems with your stocks, join investment specialist Daniel Loh and Andy Yew to help you analyse your portfolio. Get Ready for a dissapointment at Jackson Hole, and when to buy? As a trader, I am always looking forward to news and events and reports that might give me a glimpse of what is going to happen next. That is how I always gain a step ahead of the market. Trading is a tough world. We need to gain whatever advantage we have over the retailers. The thing is my habit is always to have a plan A and plan B. 1) My gut feeling is that this Friday at the annual Jackson Hole meeting, Ben Bernanke would not announce any QE3. So if I have short term positions, I might want to exit first going into Friday. For Singapore stocks, I would exit on Friday. For US Stocks, I would exit before 10am on Friday America time. If you are a mid term trader (2-3 months), continue to hold your positions as we are still optimistic about the stock market ahead. 2) If there is a disappointment, depending on the severity (the market will tell you), I would react accordingly. The more disappointed the market is, the better for me as I will be waiting to enter to buy stocks at a discounted price for short term trades. The thing is the market will come back with expectation of another QE3 at the next FOMC meeting on 12th and 13th September. Any fall in the market before that FOMC meeting is a great opportunity to accumulate short term position! 3) I am also keeping a lookout on the US jobless claims this thursday and next thursday. It will give me a glimpse of the job situation in the month of August. If both are worse than expectations, be prepared to liquidate whatever positions going into next friday! Job reports like the Non farm payroll might have a chance to fall below expectations. If that happens, I would go into the market the following Monday and hold my stocks for a longer duration. If both jobless claims are better than expectations, I would hold my stock positions through next Friday as the market have a high chance of reacting positively to better jobs situation. 4) If there is a positive QE3 statement that will be announced on Friday's Jackson Hole Meeting and welcomed by the market, I would pounce on accumulating my Silver positions (silver ETF, symbol SLV), my US stocks on Friday and Singapore Stocks next Monday. I know that a lot of the investors do not like the hassle of studying these fundamental news and focus totally on charting. 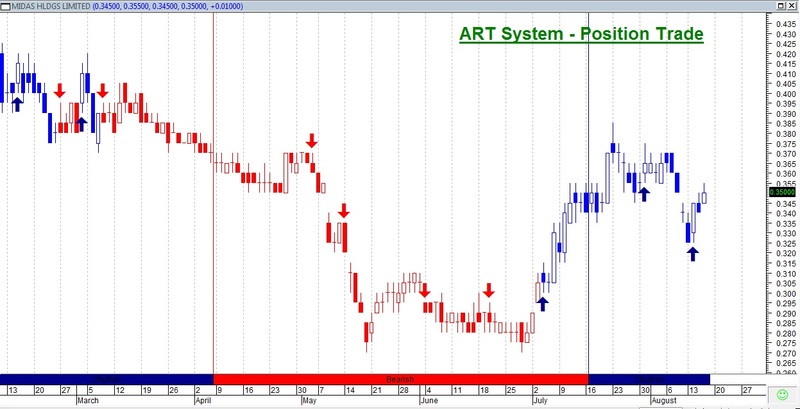 I feel charting is only one part of trading and to be good trader, knowing economical news and its applications are important too! Hurricane Issac swamps America, is there an opportunity? 7 years ago, America suffered from Hurricane Katrina. Now we have Issac. Will there be a rise in the oil price or natural gas? The last time round natural gas price for Katrina shot up. Currently this round, there has not been such a sight yet. But today crude did go up 60 cents. I feel that this time round, America is quite prepared. It would not be as bad as Katrina 7 years ago when Americans are caught unaware. So I think Crude oil this time would not shoot up terribly. But having said that, there might still be some opportunities. Let us continue to watch the progress. Today CNBC keeps focusing on this hurricane... we keeping a lookout also. Singapore Stock Tip: Did you make $ from Asiasons as we mentioned? Will Asiasons continue its flight higher? Currently we have not seen any danger in this stock. It should continue its ascent higher. On 17th August we mentioned it should break new high and is consolidating then. It did. Currently we still maintain our target at 67cents. Today it is 62.5cents. Is trading that hard? Only when you don't understand the market and stock. What to Do with Sakari after gapping up 40cts? We have been urging you to buy Sakari since 26th July as we think it has good fundamentals just like Ezion. Well, we did not know that it be acquired. But that is the good thing about good fundamentals company. It will come back. But one friend asked me what to do with Sakari? Well easy, my answer is to SELL it! At least half of it, if you have. If you are looking of going into it, I suggest there are other stocks..
Based on my analysis, there isn't any much upside now... $2 being a strong resistance...it needs to consolidate. I do not know if it will be delisted, but if it did not, $2 will be a main barrier for this stock. Not much upside. Switch your stock now! Dont buy these few days. Yesterday marked the first triple digit decrease in Dow Jones for the last 24 trading sessions, which is month than a month. This seems to give the FED a smack in the face after the positive expectations generated 2 days ago. Like what we previously mentioned, I always pay attention whenever Dow Jones falls by 100 points. There may be a temporarily halt to the powerful rally. In fact as a trader, I like this pause. Only when Dow Jones pause, it can rise further. This is a pause that will enable us to get on the bus. My trading strategy would be to watch Dow Jones carefully. For my long term positions, I continue to hold. For my short term positions, I liquidated. Dow is at 13057 at closing yesterday. 1) Take note these few days: If Dow Jones comes back to 13150 again in these couple of days, that means it has recovered after these 4 straight days fall and might be ready to challenge 13330 high again. 2) If there is a triple digit gain, this may be a signal that Dow Jones has regained a bit of its composure and confidence. 3) If Dow continues to be in the red, let us continue to remain in the sideline. 4) If possible, these few days take note of any stock that did not fall much and hangs there. These may be the stocks you want to invest in when market turns good. 5) Next week Friday, there be a Jackson Hole meeting by the FED, we see if next week the market rebounds with QE3 expectation again. Get in the STOCK Market now! Do not miss this opportunity with QE3 expectation coming. Park some of your money in the stock market or else you will miss this fabulous run towards Obama election. Get in on a good stock that goes up when earnings news are released. Get in on stocks that beat the earnings and show good results this quarter. With QE3 anticipation on the way, the market won't drop much. And even if it drops, make sure you go in BUY somemore. This bull run might be the BEST in this 4 years. Get ready for an EARLY Christmas Rally this year!!! LET us make some big bucks together. QE3 active discussion by FED, bringing optimism! This is interesting. Today Fed minutes gives some signs that QE3 might be in the pipeline. They said there will be a discussion if there is a QE3 in their next FOMC meeting in september. Now Dow spiked up a bit before consolidating at 2am Singapore time. I think probably this QE3 expectation will grow over the days, nearer the September FOMC meeting in 12th or 13th Sep. Well, now I can't see market drop much given this glimmer of hope. Probably these few days, there may be more expectation factored into the market, propelling the market forward. Let us see how the market reacts these few days. Somehow I got a feeling that probability of a QE3 is high. I think if Ben Bernanke would not have one, he probably would not give us such a high expectation of one. If not, the market will fall hard in September and it would not help in Obama election which is just 2 months away! Anyway we just play with the expectation leading up to FED's next meeting. You may want to really take out your guns and pull some trigger to buy good stocks whenever the market drops! A Temporary Resistance for the DOW? After 6 consecutive weeks of run-up in the Dow Jones index, Dow reached its high 13330 points yesterday. The highest Dow reached in this 4 years rally is 13338 points. Upon touching that 13330 mark, Dow swiftly retraced, bringing down major stocks and index in US. 1) Dow decreasing a triple digit in 1 day (one hundred points). Yesterday drop of 60 points is considered mild. 2) Dow decrease 3 days in a row. If that happens, this will mark a temporary slowdown to the bullishness. For short term players just watch out for this indication. Long term players, it is ok to hold on to your stocks. In US, Energy Stocks may have reached its peak this week. A suggestion would be to maintain some short positions in Energy sector stocks to hedge against any bullish positions you may have. 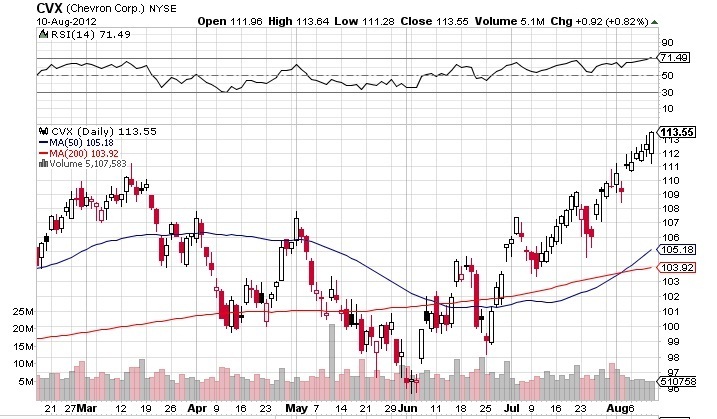 Energy stocks may find difficulty to go much higher from now. 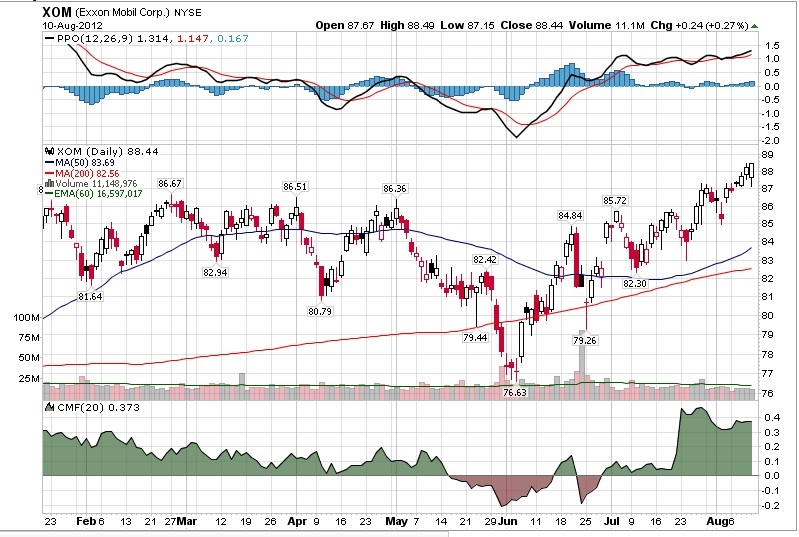 I did not study if singapore stocks like Keppel Corp has any direct relations to US Energy sector. But I guess there there is some relating factor studying from the chart. From now on, better do not buy anymore Kep Corp stock. Anyway from the chart Kep Corp has reached a Double Top of $11.60. Just be careful! Singapore Stock Tip: Asiasons a stock in consolidation breaking NEW HIGH soon? We have been mentioning this stock ever since it is 30cents plus. Run up great, and continues after its earnings on 14th August. Our next target is 67cents, stop loss better put at 53 cents. 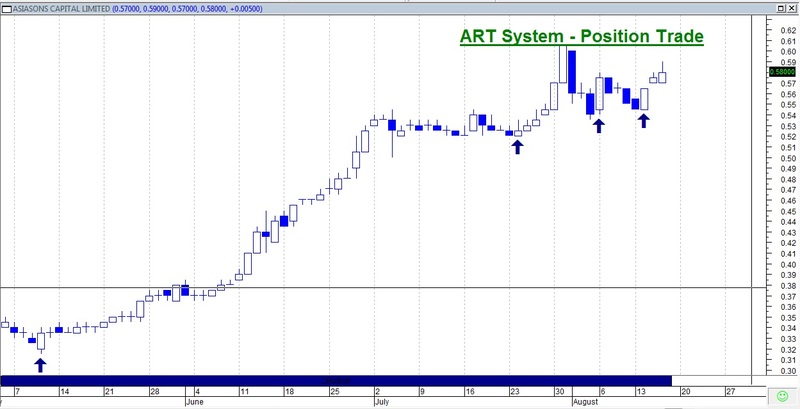 This is a Singapore stock that has a Bullish Signal using our "ART System". On 14th Aug just released its earnings. Positive result...Fundamentally it is quite ok. Technically we think it has a chance to go higher. Seminar on Fundamental Analysis of Stocks! Limited Seats, Sign up today! Are we bullish today in US market? Look at the chart of DOW at half time, lunch time. That is what I mentioned, the market just cant drop now. Still bullish. Meantime, our graduates are having a jolly good time locating bullish stocks all day long. Amazon, Baidu, Apple, 3M, Monsanto are running and breaking out. Spain goes up 4% on getting a good round of money. German DAX shoots up at last hour hearing the good news. From the discussion in some chatrooms and facebook and websites, we know some of the retailers are betting the stock market to go down, talking about shorting this stock and that. We suggest against doing it now. It is because market is still at a bullish mode. How do we know? Look at Wilmar and Genting! Their earnings are terrible. Wilmar gaps down 30 cents at the open, Genting has a terrible result too! And yet the stocks come up after earnings day. This shows that even "lousy" stocks are being SPECULATED up. The market is nonsensical now, meaning it does not make sense. And as a trader, we need to develop an intuition. I counted a lot on intuition and feeling throughout my years of trading in the US market. At this moment, I cannot sense any bearishness yet! If you are still waiting in the sidelines to wait to buy the stocks, you might miss one of the greatest bull run these couple of years until OBAMA US presidential election. Of course short term wise there might be a small consolidation in this long term bullish trend towards election. One way to spot a short term down trend is a triple digit decrease in one day for DOW, or 3 consecutive down days for the DOW. At this present moment, I feel Singapore market is better than US now. US is in a bit of consolidation the last week. But it is not dropping either. Many economists expect Fed Chair Ben Bernanke to send a signal of the central bank’s intentions in his remarks at the Fed’s summer retreat in Jackson Hole on Aug. 31. FOMC meeting: Ben Bernanke will speak again at the 2 days meeting. Shares Investment: Pertaining China’s 2Q12 GDP figure of 7.6 percent, concerns have been raised and do you think that China is really heading for a hard landing? Jim Rogers: Firstly, I would suggest not paying that much attention to the GDP figures because it is a lagging indicator and it does not accurately reflect the current conditions of the market. On the part of the slowdown in China, should we be surprised by it? I mean, they’ve been trying to slow down for the past three years and they have. As you put it, some parts of the Chinese economy will be expected to experience a hard landing, and some parts of the Chinese economy will be expected to do extremely well going forward. I expect the property sector will experience the hard landing and sectors like agriculture, infrastructure, and water treatment will be having a great potential and future. SI: The Shanghai Composite Index sank to close at its three-year low on 20 Jul-12 even after the Chinese central bank surprised the market by cutting its benchmark interest rates twice in a month. What is your view on this? Jim: I’m not buying Chinese shares right now if that’s what you mean. I own Chinese shares. Whenever the Chinese market collapses, I’ll buy more for my children. I don’t sell my Chinese shares; I just buy more whenever they collapse, but not now. SI: Since mid-2011, gold price has been falling as China and India’s growth started to slow. Do you think that the price of gold will continue its downward trend and do you see this as a buying opportunity? Jim: I’m not good at market timing so I can’t be absolutely certain. However, I do own gold and silver. I do not know what’s going to happen but gold has been going up 11 years in a row. I have not heard that for any asset without a down year. Gold is obviously correcting right now, maybe 15 percent to 20 percent from its all-time high, which is not very much for a normal correction in any markets (normal 30 percent to 40 percent). It will not surprise me if gold didn’t continue to correct. Moreover, gold has only been down 30 percent once in the past 12 years or so, which is extremely unusual. What’s going on with gold right now is abnormal, what is normal would be for gold to actually go down 30 percent to 40 percent. That will then be the time to buy, “if” and when that happens, I hope I buy more. SI: In that case, do you have any target price in mind for gold? Jim: No. I have no idea what’s going to happen. I know in the next ten years it will be much higher. I mean, depending on what happens in the world, like if Spain suddenly decides to declare bankruptcy and everything collapses, I’ll find something to buy as things go down. SI: Last year you mentioned in a video that in the future that in the future farmers will be driving lamborghinis and stock brokers will be driving taxis, considering that and the surge in corn’s price and volatility in the commodities market right now, what’s your take on commodities? Jim: My statement about farmers driving Lamborghinis and stock brokers driving taxis stand. I’m very optimistic about agricultural still. Agricultural prices will have to go up a lot. The inventories of food are near historic lows and we are running out of farmers. Therefore any shocks or bad news to agriculture will have enormous effect. Unless the prices of agricultural products go up higher to attract more labour, capital and management, we are going to have an unmitigated situation that the world has never seen. SI: Shifting the focus back to the general economy, do you foresee a possible re-enactment of stimulus measures like operation twist if the Eurozone crisis does not improve? Jim: Yes I do, unfortunately this is because all governments want to be re-elected, therefore they’d do everything they can to do so. All they know is to stimulate, whether it’s by printing money or spending other people’s money. It’s the wrong thing to do, but they don’t know any better. So you’re going to see a lot more government actions, because they’d want to be re-elected. SI: Considering how long this issue has been dragging, what is your take on the constant pumping in of money to salvage the European nations? Jim: I think it’s a wrong move altogether. I mean as you can see, so far printing money hasn’t work, and it’s not going to work this time. The world has staggering debt problems, so all these money printing is just going to make things even worse. Things are going to get really bad in 2013 and 2014. So they should be really careful about printing money. SI: A few months back you mentioned about shorting emerging markets as a hedge, what are the emerging markets you are looking at that you think has a long potential for? Jim: Well, I’m very optimistic about Myanmar, although there is no stock market there but I do own Yoma Strategic Holdings (Yoma). There are not a lot of stocks that you can own which do businesses in Myanmar, but Yoma does. Other countries that I’m looking at for the most part are mostly countries with no stock market yet but are going right. Like North Korea, I’m very optimistic about North Korea, but there’s not really a way to invest in North Korea yet. SI: Lastly, what would your advice be to anyone who wants to invest right now? Jim: If they don’t know what they’re doing, I’d advise them not to. If they do, opportunities can be found as there are many things which are knocked down right now, making such opportunities cheap. Essentially I think the most important of them all is to invest in what you know about. Don’t listen to someone you heard on the radio or internet, and let it sway your decision, they could be wrong. If you’ve done your homework, if you know what you know, don’t listen to others. Jim Rogers is a keynote speaker at Shares Investment Conference 2012. Watch him share proven investment strategies and intimate thoughts ‘live’ in person! Yesterday Sakari drop around 10cts in 1 single day. In my class, a friend tells me Sakari goes down because of Earnings less than expectation. Without researching, I published an article asking telling all to leave this stock because of bad earnings. In fact after my research, this is not true. Sakari beats earnings expectations on 30th Jul! 2) The price of Sakari reached $1.50. This is what I called the "Law of Gravity of Price", a magical number like Fibonacci set of number where it needs to rest for at least 3 trading days. How to play this stock NOW? In fact, profit take first if you are a short term trader. The ball is rolling now, if this report is correct! Anticipation has started and if it is true that its pre-launch date is 1 month away, I believe it will break its all time high price of $644 soon. Time to focus on this stock. - Are turnarounds of the Dow Jones and STI happening soon? Some of you may fear STI and KLCI will be consolidating. Temporarily, I have not seen any signs of it slowing down yet. Today STI goes up another 10 points, KLCI 1 point. I know some of you are waiting for a retracement to get in. But like what I said, there are more people being afraid of missing the bus than wait for the bus to stop. Traders jump on board the bus when it slows but did not wait for it to stop. That is the sentiment now. Until I see a change in sentiment, I am afraid this bus will carry on to the next destination. Try to pick up some stocks whenever the stock market drops a bit. Like what I said in June, you probably would not see Dow at 12000 points again this 2nd half of the year! If you have been paying attention to our articles, we have been trying to get you to accumulate stocks. Now that we have entered the earnings season, buy stocks that react positively to its earnings news! This will be the stocks you should play this season. Do not focus on Genting! Today it goes down again after earnings. This is a LOSER! If you think you can get this stock cheap, you may be wrong. Unless fundamentally it proves itself it can garner the VIP revenue again. Or else it should remain in the Rubbish chute, meaning DON'T TOUCH IT! Today, Sakari goes down on analysts' downgrade. My suggestion is to profit take. If Sakari ever comes back to $1.53 again, you may want to accumulate again. To summarise, pay attention to your stocks' reaction after earnings announcement. It will tell you whether you should put it inside your trading dairy for this season! 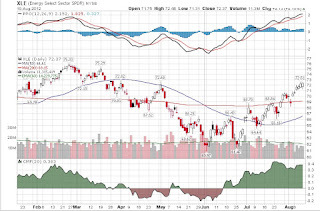 Beware of US ENERGY SECTOR trend, may turn bearish within 1 month! I am glad to say we have been very accurate in predicting the US SECTOR in Trend and when will the sector change in direction. We issued predictions often before others can see the change in trend. If you just follow our sector rotational predictions, you would have make good money this year. As an example, in May this year our research already shows that Energy sector turnaround is about to happen in 2-3 weeks. Indeed Energy bottomed in June. We asked everybody to get in! 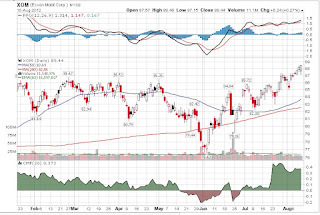 Check the charts of Energy Sector ETF (XLE): See the double bottom in 1st June and 25th June. If you buy the ETF at $60, now at $72, you would have made 20% ROI return in 2 months! If you buy the high profile Energy stocks like Exxon or Chevron, you would have make GREAT $ too! Exxon goes from $76 to $89 now. Chevron goes from $95 to $113 now! Just by following our tips this year in the US market, you would have make tremendous money! Today I am going to offer you another tip! We predict that Energy sector's trend is about to change within the next 4 weeks! We will let you know the time when it does. Do not short now as it is still bullish, in overdrive mode! But do keep a lookout of our signal, once it change, we will issue a BEARISH SIGNAL! You need to learn about US Stocks!!!! It is not hard to make Money!!! Dow is weak but can't drop, STI is moving towards 3240?? I am having a rest in US Stocks. This week the market is stagnant and not moving much. S&P500 at 1400 seems to be a good hindrance. A lot of US stocks are hovering and not powering on. But it seems not to drop much either. Directionless is the word. Currently, I am not entering the US market and holding my guns until I sense a run-up again or when things get bad that I short. My feel is that Dow Jones need to revive its vibrancy after a good run-up these couple of weeks. A consolidation without panic is always good. Resting in peace for stock market is a sure sign of gathering strength for next burst! A 100 point increase will be a good signal to look out for. Apple is now resting well below $625! Remember to catch this sleeping giant after it breaks out of $625. I am looking at $647 target price next. See if this sleeping giant awakes from its dreams after yesterday ex-dividend date! Today someone ask me about STI. I feel STI is still strong and powering along. Based on Mr Hu Li Yang box theory, if STI continues to remain above 3000, it should move towards 3240, a likely resistance region. Before that 3100 is a small resistance. As I have mentioned in June, we expect this 2nd half of the year to be a bullish run till US election! Do take note of any opportunities to pick up some stocks, like the 2 days drop before National Day. Players are scared of missing the run up instead of selling away their shares!!! Can you sense and feel the market pulse? Sense the market to be a good trader! Anyway Let us enjoy our Holiday!!! We would like to wish everybody a Prosperous Year Ahead! On the mid term horizon (2 months) , our market indicator has been showing healthy signs that the market has more strength to go. NYSE (3000 stocks) and Nasdaq (3000) stocks all are not yet in overbought situation. However we are already taking note of Energy sector. 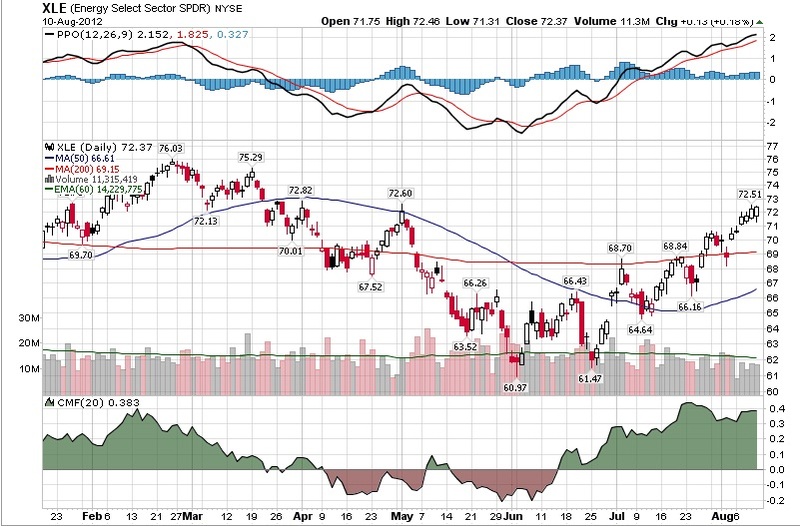 Energy sector has been overbought, now above 70% region. We expect there will be some cooling in the Energy sector in 1-2 months time. In fact our market sentiment indicator has caught the energy sector run-up in June. It has gone up fast. Once it turns bearish, we have to avoid Energy stocks! We have also been spot on in the technological sector turnaround in June. Financial sector is the only sector that is still in Bearish territory. Just by following our market sentiment indicator, you should be making great money! Singapore Stocks have been having a great day. 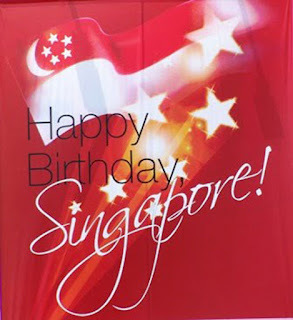 Some traders in Singapore might use this chance to liquidate some positions over the holiday 2moro after noon time. I would encourage short term investors to also follow suit. Take a bit of profits off the table. For longer term players, of course, continue to hold your positions as mentioned. We have been perfectly right in our forecasts so far in July and August. Last week I also issued a forecast that Non farm payroll or jobs reports has a good chance to be good. Indeed everything came out as expected. Non farm last Friday is extremely good, thereby pushing the DOW up 200 points. Today it is still up by 80 points. For those who have not entered, my advise is wait till after holiday! Big Ben and Super Mario disappoints with no QE, what strategy next? Last week, we did mention that about our game plan. Our plan is to sell into the rally we had when there is a double QE expectation on US and Europe. We told our readers not to take the risk of no QE again which will definitely set the market back. Today European Central Bank President Mario Draghi, nickname Super Mario is beaten by his own words. And of course when there is no action, the market dissapoints. FTSI 100 is down by 51 points, 0.88% while DAX is down by 148 points, 2.2% on thursday closing. Dow on Thursday mid afternoon, is down by 145 points, a 1.11% drop. In fact after doing an analysis of the jobs reports, our research shows that chances of the Non-farm payroll beating expectation is there. Although we may be wrong as anticipating report numbers are a tough task, we are tilted more towards an unexpected upside surprise. This week I heard a lot of analysts and gurus on CNBC or websites predicting that the jobs numbers will be awful and terrible. I think we are perhaps the first to think positively. Yes, currently we are alone. I got a sneaky feeling that perhaps Ben Bernanke knows something about the jobs report too. This time in the FOMC meeting, he sounded casual and did not mention anything about jobs may be getting worse or give assurances that FED is thinking about possible measures. He did not try to pacify the market expectations. Don't forget that on Wednesday, ADP employment report is good. Of course on Friday, the result will tell itself. However as a trader, I always like to think of possible scenarios. That is how I always seem to be one step ahead of others. 1) If Jobs numbers are good and market starts to rebound strongly after today's fall, start to buy some stocks. I can sense that confidence is still in the market and it seems the market sentiment now is traders are more afraid about missing the bull run than not. 2) If Jobs numbers are not good and market tumbles badly, let the market correct itself, stabilise then enter some small positions. A good way to gauge a change of confidence after a selldown would be a triple digit one day increase in Dow Jones or a 2 day increase in Dow whereby it ends the day on a high or a consecutive triple day increase. 3) If Jobs numbers are good, but market did not rebound strongly. It means that traders probably do not want to enter position over the weekend. Be prepared for any rebound next week. Get ready your weapons. STI has been strong! going to new height this year ends at 3050 today! Good news that STI has clambered over the 3030 barrier. Has it broken out? Let me take a leaf out of Mr Hu Li Yang textbook. If an index stands over a controversial support and resistance figure, it needs to maintain over that figure without falling back at least 3 days. So this week, we shall see how resistant is the STI. If it falls back into 3000 again this week, it does not mean that it will continue climbing higher. If it has stood above 3030 without falling back this week, the next probable target is 3240! That is the prediction that Asian Leading Investment Guru Hu Li Yang has. STI next resistance is 3240 if it stands above 3030. If after this week's reports and news isn't that bad, probably it is REALLY time to buy some stocks!!! As mentioned 1 month ago, we are really bullish in mid term (2-3months time). We are anticipating a rally towards the election and an early christmas rally in Wallstreet this year. I am now preparing my slides for my malaysian trip... not enough time to update... but will give my view on FED tonight and Europe 2moro... stay tuned!! !